We manufacture a wide range of coaxial cable assemblies for a diverse range of applications, including RF, data, video and instrumentation. All common types are available, custom manufactured to your exact requirements. Most miniature and sub-miniature coaxial cable assembly types are available, such as the majority of high frequency, data and signal RG types together with LMR types originally developed for microwave and satellite communications. Our automated coaxial cutting and stripping facility ensures consistent and highly accurate cable preparation in accordance with connector manufacturer's tolerances. We can accommodate co-axial and tri-axial cables of up to 11mm O.D. with strip lengths up to 40mm. As with all cable assembly products the completed coaxial cable assemblies are subjected to 100% testing prior to despatch. 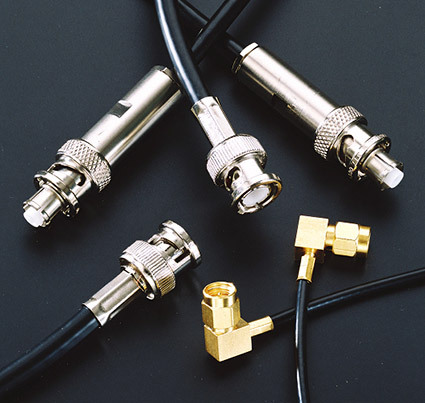 Large range of coaxial connector types possible, including BNC, TNC, SMA, SMB, SMC, MCX , MMCX, F-Type, N-Type, etc. Most RG and LMR cable types available. Custom manufactured to exact customer requirements. Automated cut and strip of coaxial and triaxial cables of up to 11mm O.D. Low, medium and high volume production.